I haven’t attempted a climb of any significance since doing Mt. Marcy about 15 years ago. During that climb I discovered I could still go UP forever, but one of my knees had decided it didn’t like the going DOWN part. The last 3 miles or so of that excursion were agony! 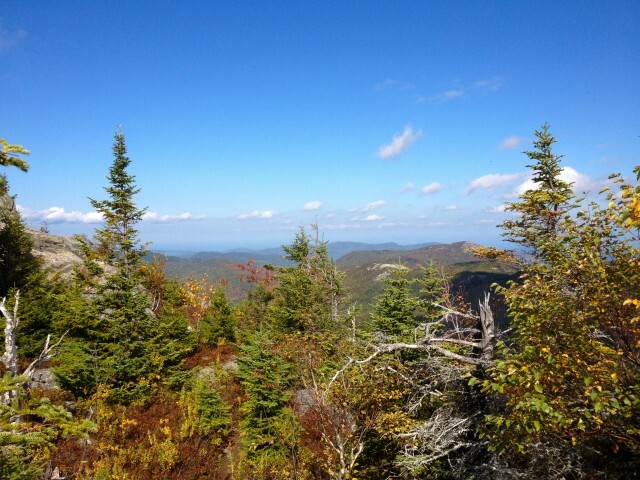 I've been thinking it's time to tackle something a little less ambitious than Marcy or one of the High Peaks. 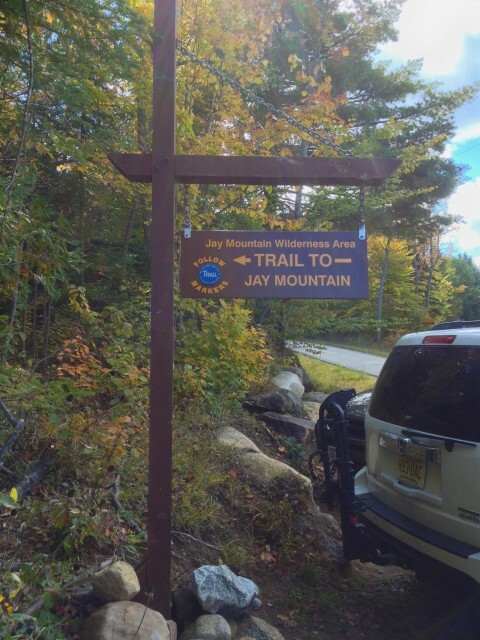 When I decided to climb and write about Jay Mountain for this blog post, I encouraged my husband to join me. He has some physical limitations, but he readily agreed to go along (misery loves company). Since this climb is significantly shorter than Mt. Marcy, I figured my knee would survive and he’d be ok. I loaded up on ibuprofen beforehand, and added a bit more during and after. I can honestly report the pain wasn’t bad although there was some. Hey, no pain, no gain! Jay Mountain is in the Jay Mountain Wilderness Area, almost due East of the village of Upper Jay. It’s reached via Trumbulls Corners Road to Jay Mountain Road to a parking area on the left at the intersection of Jay Mountain and Prestonia Roads. There’s parking for about six cars at the trailhead. 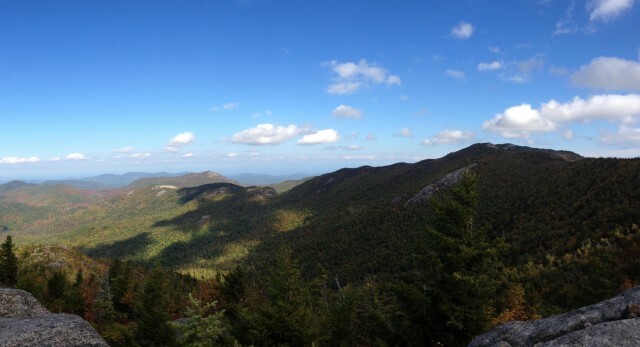 Since Jay isn’t one of the High Peaks it’s not so well known or traveled - or so I thought. Much to my surprise when we arrived, there were already five cars in the lot on a Wednesday. The secret must be out! We all piled out of the car about at 12:15, ready to tackle the most ambitious hike we’ve done in quite some time - myself, Glen, Bear our yellow lab, and Duke our labra-dane (yes, he’s half Great Dane and all legs). 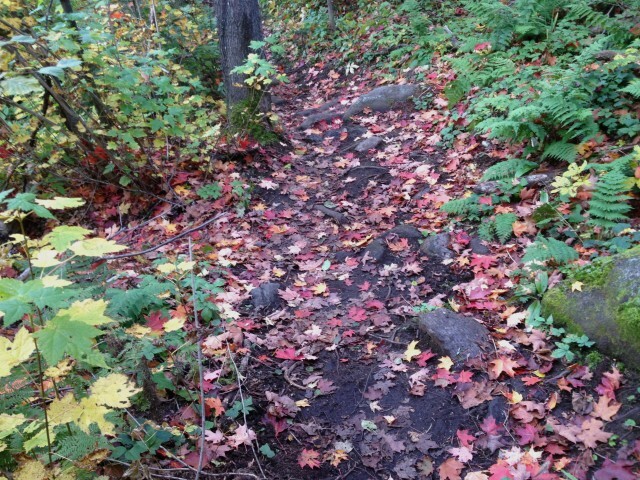 The trail starts at a modest incline for about 50 yards to the DEC trail register. Checking in at these registers is very important for several reasons. First and foremost, if you become lost, rangers have a record of you having been there. It gives them something to go on if someone’s lost and no one knows their destination; by checking these registers they can determine which trail system the individual is supposedly in. The second reason is that it gives the DEC (NYS Dept. of Environmental Conservation) statistical information on how many people use the trails and where they are from. It also helps guide decision-making for our wilderness areas. It’s valuable information and everyone should sign in, so just do it! After signing in we headed out with Duke taking the lead in his usual style of running way ahead and circling back through the woods. Duke wears a loud cowbell on his collar so we have a general idea of where he is. He frequently needs calling in as he’s part Great Dane and has a hound’s nose. He also wears a bright orange vest during hunting season. Bear, on the other hand, stays right with us on the trail most of the time. 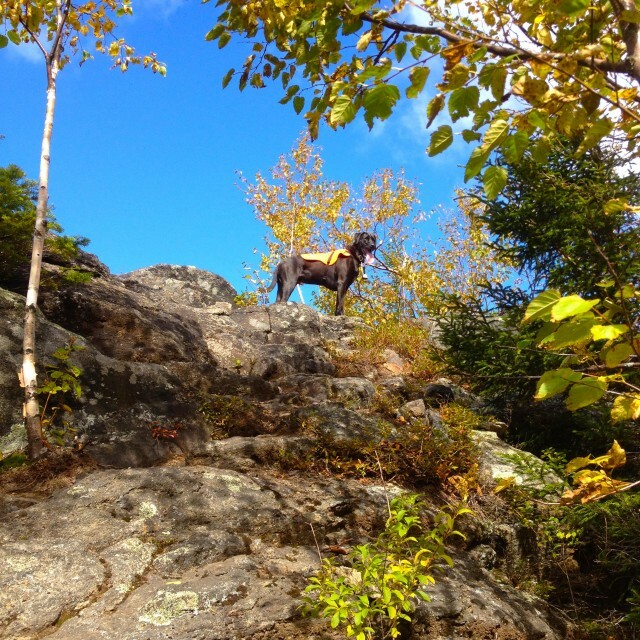 Duke will end up doing about 3 times or more the number of miles we put on during any given hike! I highly recommend putting a bright orange vest on dogs while hiking during hunting season. And the bell is an added piece of protection. Duke could easily be mistaken for a bear as he’s so big and it’s now bear season. The trail traverses a beautiful hardwood forest all the way to the top, it's predominantly beech, with varieties of birch, oak and maple. 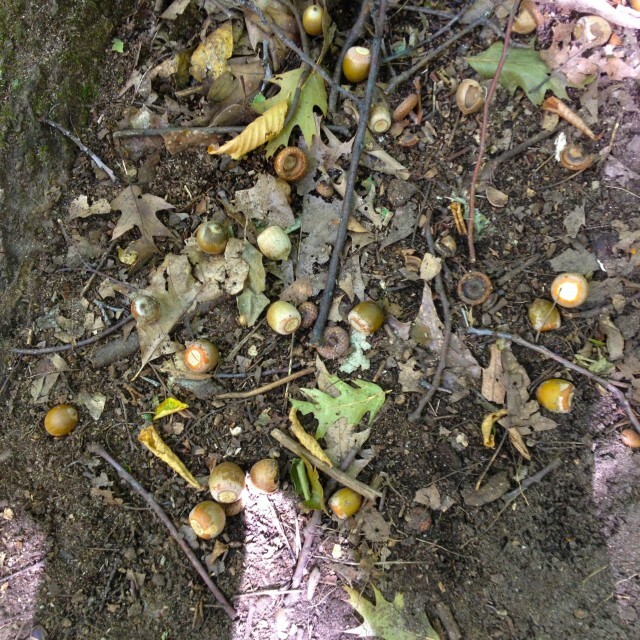 There were tons of acorns all over the ground in many spots on the trail. At one point, we nearly got ‘beaned’ several times by acorns being dropped by squirrels from the trees above us! They were falling all over the place, making loud thumps as they hit the ground. The forest was beautiful on this sunny, warm day with the sun creating a dappled effect on the forest floor through the changing fall leaves. Above: A mysterious gigantic oak leaf we came across! I've since been informed this is most definitely a northern red oak by our botonist friend. 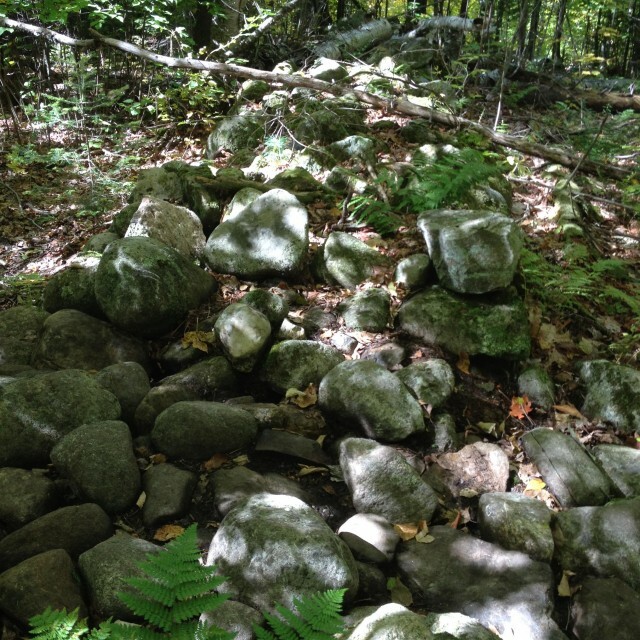 About a quarter mile into the hike we had to cross a very large stone wall that had obviously been there for many decades. It had most likely been created when the land had been farmed in the distant past. I can’t imagine what could have been grown on this hillside. I’ll have to investigate the history of this tract of land. Some of the stones were gigantic, and the wall must have been done by hand, making for a very big job at the time. It continued on into the forest for a bit longer as we could see through the trees as we hiked on. Most of the trail is at an incline that’s not too terribly strenuous until about 1/2 mile or more from the first summit. At this point it becomes fairly steep, but with lots of switchbacks to break the incline. It took us about two and a half hours to reach the first scenic overlook, which is really not the true summit, but that’s as far as we were going that day. We stopped many times on the ascent, mainly to give the dogs water, but to take a breather ourselves as well. There isn’t a water source anywhere on the trail except for a small muddy stream bed that probably would have been totally dry had it not rained the two previous days. 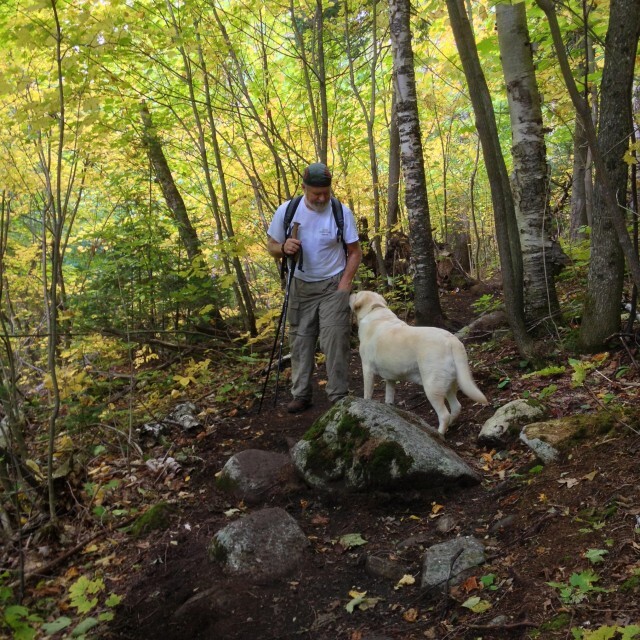 If you hike with your dog, make sure to bring enough water for your dog and yourself, as well as a bowl for the dog. At the summit there were a few “bowls” in the rock which were filled with the recent rainwater, although you shouldn’t count on that. The dogs lapped up the water quickly. There are spectacular 360 degree views from the scenic overlook. 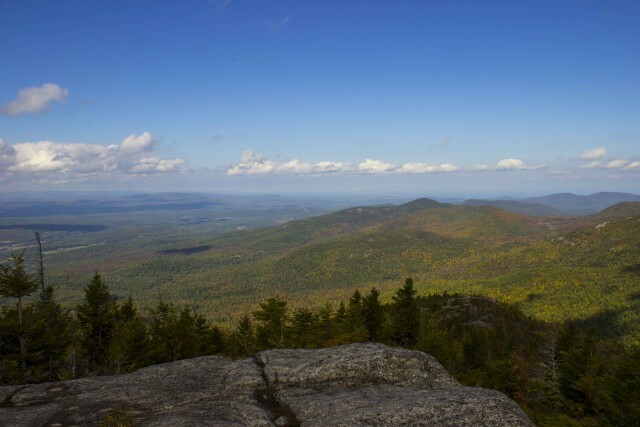 We could see Lake Champlain and the Green Mountains of Vermont as well as south and west to the High Peaks and north to the Ausable Valley. 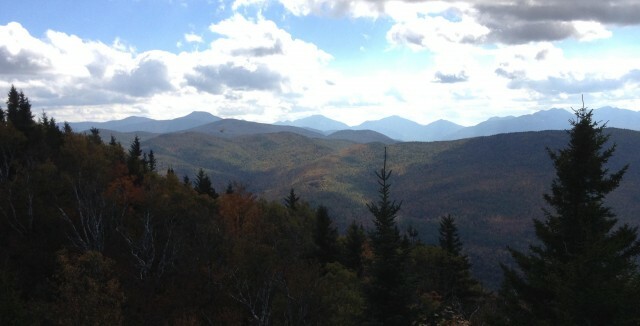 There’s a great view of Whiteface Mountain Ski Center as well. The fall colors in the Whiteface Region and Ausable Valley aren’t as far along as in the High Peaks Region, so it was a little early for Mother Nature’s greatest spectacle, although there was some color visible. 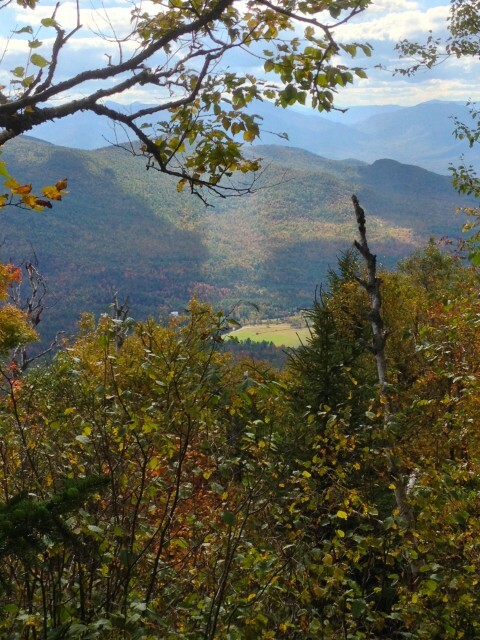 In another week or two the Ausable Valley floor and hills will be awash in gorgeous colors, so it's the perfect time to get out there as the High Peaks will have gone past peak. The second summit of Jay Mountain is another mile and a half across the rocky ridge line to the east of the scenic overlook. Our schedule (and my knees) didn’t allow for another mile and half that day, so after spending about a half hour or more on the overlook resting and eating snacks, we started our descent. This is when I began being very cautious how I placed my feet to protect my right knee from too much bending with my weight on it. My trekking poles really came into play here. They make a huge difference in how much weight your legs have to bear if you use them correctly to absorb some of the impact. Trekking poles are also a big help ascending during the steep sections and can aid greatly for balance. They come with removable rubber tips, which we kept in our pockets until we reached the rocky summit where we added them for additional non-slip traction on the rocks. So, descending isn’t as fast for me as for someone with great knees. I couldn’t just run down, hopping from rock to rock like I used to be able to! It took us about an hour and three quarters to reach the parking area at the trailhead. It was almost five o’clock. Our round trip hike to the first scenic overlook had taken us about four and a half hours plus. Duke and Bear had never been on a hike of this length, but they had a ball and have ‘bagged’ their very first big peak. They were exhausted and certainly slept well that night. We were delighted we made the effort to climb Jay Mountain. It was worth each and every step! 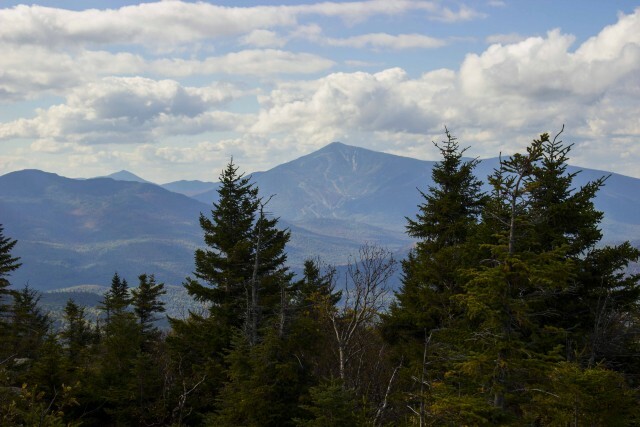 If you haven't spent any time in the Whiteface Region, now's the time. Make plans and check out our lodging options as well as all the other recreation opportunities and events while you're here.